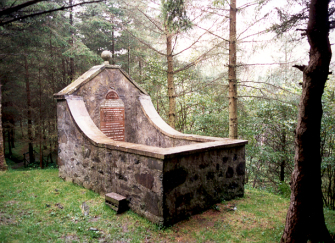 The enclosure with the grave to Murchie and MacIlwrick is located on th east side of the Cross Water of Duisk, to the south-west of Barrhill village. A locally-signposted footpath leads to the site. 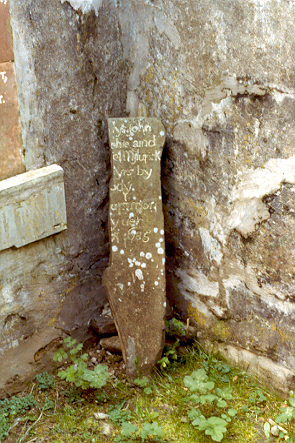 The old gravestone of 1787 was broken many years ago - a fragment remains - and a newer stone was erected in 1825. WITHOUT ANY TRIAL NEAR THIS SPOT. The monument underwent restoration work, including repointing the surrounding wall, in the summer of 2018. The funding came from Carrick Futures, with funding from Scottish Power Renewables’ Mark Hill and Arecleoch wind farms, and additional monies from the Scottish Covenanter Memorials Association. John Murchie and Daniel MacIlwrick (sometime spelled Meiklewrick) were pursued by soldiers under Lt Gen William Drummond and found to be carrying Bibles. This took place at Waulkmill, near Barrhill, in 1685. As they ran off, they were shot without trial, their bodies being left where they lay until two women recovered the bodies under cover of night and buried them. It is said that the soldiers took their Bibles and burned them back at the garrison in Kildonan House. Traditiona claims this was later to be destroyed in fire. 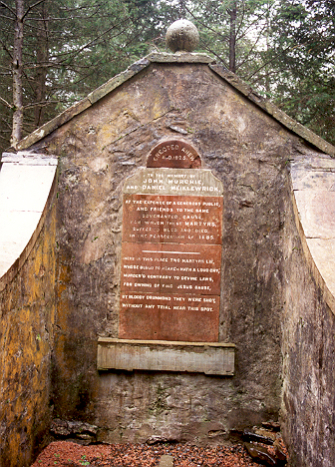 Daniel MacIlwrick was the son of the farmer at Altercannoch, and Murchie was a friend from Barr.